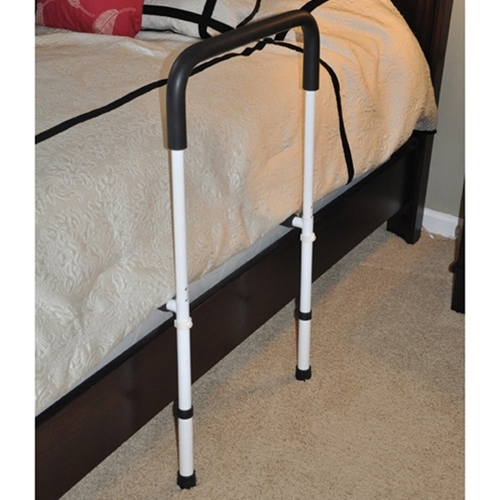 Drive Medical Adjustable Height Home Bed Assist Handle from HealthyKin.com provides assistance for get into and out of your home-style bed. You won't have to worry about the fit since the handle attaches to either side of the bed. It simply slides underneath the mattress and includes an added feature on the base bar, "no-slip foam" that helps hold the bar in place. The removable handle is part of an all steel, chrome-plated construction that is strong, solid and easy to clean. The unit arrives in three pieces and can be assembled quickly and tool-free, and it also can be adjusted flat for easier storage. The 19.75" (W) x 13.5" (H) x 32.75" (D) rail can withstand a weight capacity of 250 pounds and is protected by a limited lifetime warranty. 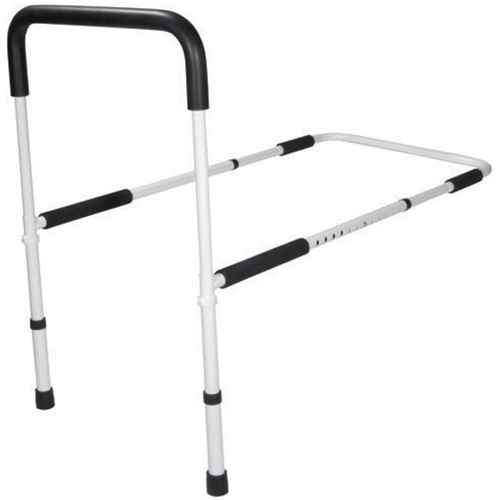 Perfect for a bedside assist! Already had one for the side of the bed. Ordered this one for the foot so we could attach a strap to pull myself up to a sitting position. Works great! The directions are unclear, fortunately the item has only 4 pieces so it is easy to figure out. This item was to tall (by 2 inches) at the lowest setting on the legs. We had to find something to raise the entire bed for this to work. I was trying to find on several similar items just how low from the floor to the top of the box spring it was but the information was unclear. Great product but my husband strained his good side getting out of bed.